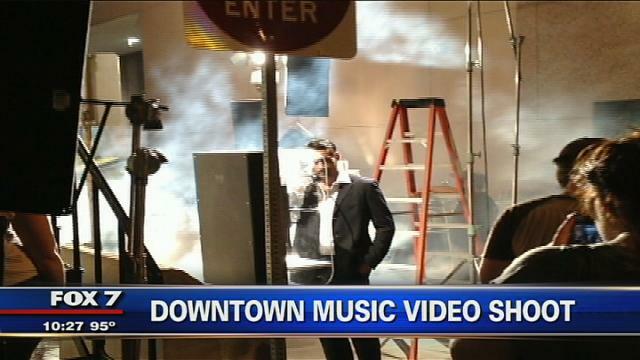 This week, country music star Lisa Matassa shot part of her new music video right here in downtown...behind the FOX 7 studios in fact. Director Tracie Goudie and her partner Patrick Hubick call their production company "Bird Machine Bird" and it's been a good year for the Austin duo. "We directed a video this year for Hunter Hayes called 'Wanted' and we've been nominated for several awards. We won an ACA Award. We were nominated for 'Video of the Year' at the ACM's, Best Male Video," Goudie said. For Goudie, this is a homecoming. "It feels great to be back! I've been gone for a little over 4 years and I lived in New York and that was a great experience too but I feel like when you're an Austinite, at some point you will come back. So I'm back," Goudie said. She says they were going for a film noir vibe with this video and the alley was perfect. "We picked this alley because it's the most non-descript in Austin and it's beautiful and has a combination of these old buildings and the new architecture. Plus it's really beautiful with these fire escapes so we can light it and make it look really, really like that time period," Goudie said. Goudi has directed videos for artist Lisa Matassa before...they love working together. Matassa says her new single "I won't ask" has a message everyone can relate to. "You know, you're in a relationship with someone who maybe necesarilly doesn't feel the same way you do and you don't want them to know that you're kind of afraid. And I think a lot of people have been in that position so it's basically 'I won't ask you where you've been and I won't try if that's the way you want it,'" Matassa said. Goudie says thanks to the new Austin film incentives, she's hoping production will really start booming here in the ATX. Right now she's planning a TV series involving the life of LBJ and her first feature film.